Even granting, as the Commerce Ministry claims, that new Special Economic Zones will draw investment of Rs 1,00,000 crore over the next three years, with huge employment potential, there are several grey areas in the way land is acquired for these Zones. Moreover, the tax-break policy for export-led growth could accelerate inter-regional differences and create islands of fiscal extravagance. Special Economic Zones (SEZ) being created by the SEZ Act 2005 is an intriguing economic decision that has been castigated by the Left, criticised by the Finance Ministry, cautioned about by the RBI and frowned upon by the IMF. These SEZs are supposed to replicate the success of such zones in China and also carry forward the thrust of export-led growth. The SEZ Act 2005 came into force with effect from February 10, 2006 with the rules vetted and approved for notification. The Commerce Ministry says that investment of the order of Rs 1,00,000 crore over the next three years, with an employment potential of over five lakh, is expected from the new SEZs. Table 1 highlights some of the salient aspects of these Zones. Any proposal for an SEZ in the private/joint/state sector is routed through the State government concerned, which in turn forwards the same to the Department of Commerce with its recommendations for consideration of the Board of Approvals. However, proposals for setting up units within an SEZ are approved at the zonal level by the Approval Committee, consisting of the Development Commissioner, Customs Authorities and representatives of the State government. 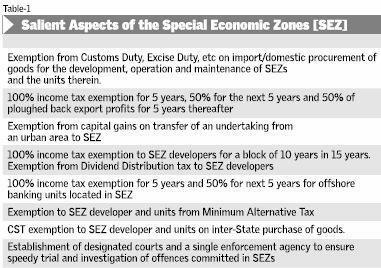 Originally, there was an idea of having a cap on the number of SEZs but recently that has been given up. The empowered Group of Ministers has recommended lifting the cap of 150 SEZs but has suggested reviewing the position after 75 have become operational, against the extant 25 fully operational ones (Business Line, August 24, 2006). Table 2 lists the formal and in-principle approvals given by the Board of Approvals after the SEZ rules for different States came into force. In all, 1,12,908 hectares — 2.80 lakh acres of land — have been allocated for this so far. The units can be IT companies existing in other locations which can relocate to the SEZ, as it is advantageous since the tax exemption era for them is coming to an end and they can continue to get the full tax-exempt benefit. Actually, the real estate needs of the IT companies should be much lower than for manufacturing activities. But the President of Nasscom, Mr Kiran Karnik, has complained that SEZ schemes favour large companies and not small start-ups, since the minimum land to be taken is 25 acres (Business Line, July 15, 2006). The Government has also permitted up to 75 per cent of the area of SEZs to be used for non-export purposes, such as housing, schools, entertainment and banks. There are also reports which suggest that duty-free shops will be allowed in SEZ zones, with the current duty-free shops in airports rushing to set up facilities in these SEZs. Actually, it seems that exports are a mere afterthought. The Finance Ministry estimates that at least Rs 70,000 crore will be the tax loss and the RBI feels it could affect meeting the fiscal targets set out in the Fiscal Responsibilty and Budget Management (FRBM) Act. A State such as Haryana, which is far away from all ports, has got approval for nearly one lakh acres of SEZ. Substantial exports do not take place by air and, hence, it is intriguing that Haryana has evinced so much interest in these Zones. The IMF cautions on the “perverse economic incentives” underlying these SEZs. Dr Raghuram Rajan, the Chief Economist of IMF, feels that tax holidays will only “encourage companies to shift existing production to new zones”(Financial Times, September 2). The Left parties in India also want a re-think by the Government. There is a need to look at this tax-break policy for export-led growth since it will accelerate inter-regional differences and create islands of fiscal extravagance. When the domestic market is very large and efforts need to be taken to augment the fulfilment of domestic needs, the slogan of the 1960s — export or perish — is outdated and anachronistic. It could end up as `export and perish’. The rates vary for different locations and it is the State government which acquires the land from agricultural owners, consolidates it and assigns it. This task is done by the Industrial Development Boards in many States. At an average price of Rs 50 lakh per acre, this totals nearly Rs 1.4 lakh crore of rupees worth of real estate made available for export purposes. More insidious is the land-grab taking place in an opaque fashion under this scheme. Sooner or later, the affected farmers are going to demand a share in the ” prosperity” enjoyed by these units and it would be appropriate that a portion of the compensation is provided in the form of cash and another portion is in the form annuity benefits till the lifetime of the farmer and/or his spouse. This can be a pension scheme for the farmers. A Special Purpose Vehicle (SPV) can be created for all SEZs taken together, which can act as a nodal investment vehicle for the farmers. This would go a long way in making farmers real partners in the progress of the IT companies and also bring in more transparency in land transactions. Governments at the State level should publish the rates at which lands are taken over from farmers and the nature of consolidation. Unfortunately, in India, real-estate has become the major issue of contention between different political parties and leaders, and it is associated with substantial misdemeanour among the political class. Unless and until the entire real-estate business is made transparent and legitimate, wherein law-abiding individuals can participate without the fear of the “land mafia”, SEZ schemes may not really facilitate earning foreign exchange or attracting FDI. It is indeed sad that many of the State governments have become real-estate brokers. Perhaps to become a global power we can declare the entire country to be an SEZ so that the commission for agents is not limited to current approvals and the so-called benefits of SEZs can be shared by all citizens.